I’m not sure that the most expedient way to build trust and social capital involves Navy SEALs, but this is still an interesting little result. Two political scientists had Republicans and Democrats play the Trust Game (a game where players pass money, the passed money is multiplied, but the original passer has to rely on their partner to share the gains). The first time they ran the study, it was a week before the strike that killed Osama Bin Laden. The second time, it was right after Bin Laden’s death. As you can see above, the effect of partisan rivalry on trust disappeared. 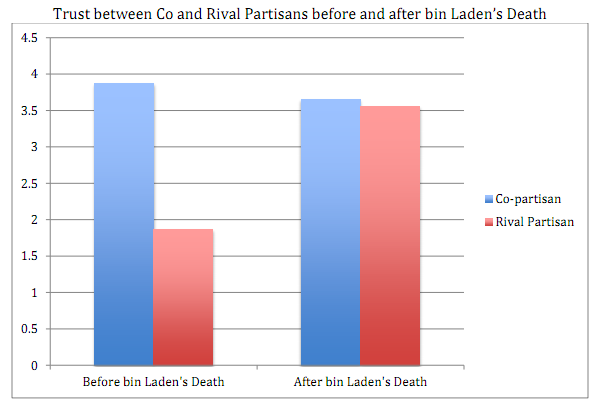 The most obvious explanation is that the Bin Laden strike boosted (shared) national identity, which made other social categories like political affiliation less salient. How should you allocate aid payments? Why are the poor unhappy?